As somebody who drinks and reviews beers fairly regularly, I know that there are certain things which you can look for when you taste a beer - flavours which are easily identifiable and which can be pulled out to convey to the reader what the beer tastes like. These are the building blocks of a review, the foundation of information, things such as which flavours of malt come through and how the hops come across, and when. But this isn't the whole story. There is so much more to some beers than you can simply describe in terms of flavour profile and style. One of the reasons I always enjoy reading Zak's reviews is because not only does he have a certain poetic way with words but he also endeavours to give you a feel for the beer, to describe the image it conjures while you drink it, rather than simply what it tastes like. 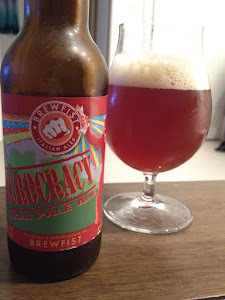 I drank a beer recently which brought my thoughts of feel vs flavour into focus, Brewfist Burocracy IPA. On paper it's another 6% IPA, not super hopped or exotically flavoured, but with something much more to it than I could easily put my finger on. It had a certain something about it which I really enjoyed. Here are the tasting notes I wrote down at the time, unedited. The smell is juicy, fruity orange hops , and a bit of dry biscuit. Taste is Apricot. Tangerine. Orange pith. Pine resin. Dry and moreish in the finish. This is a very accomplished IPA. So drinkable. Clean, well crafted, balanced. Restrained isnt the word but it definitely has a deftness of touch. It dances across your palate. Even though those final two lines give a hint of my impression of this beer, of how good I thought it was, looking back I don't think it tells the whole story. Certain beers have something you can't quite put your finger on, something which you really enjoy but which is just out of sight, a combination of flavours which creates something unique yet indescribable, a flicker in the dark which disappears when you shine a light on it. Those are the beers that I really enjoy. Aww, thanks mate. I was delighted to see on the BJCP Beer Scoresheet that they have a category for "Intangibles" (bottom right). It's nice to know that even when people are attaching numbers to qualities in beer, there is still a certain something that is present, but remains hard to describe exactly.